Attractions close to Bophut Beach. 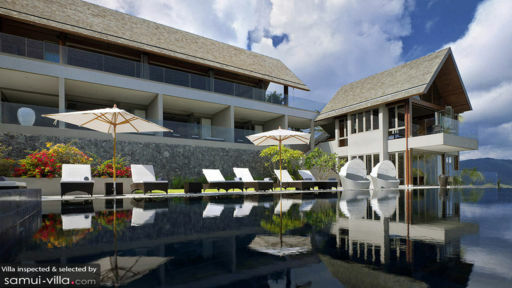 Villa Suralai is a vacation compound that’s comprised of two pavilions illustrating contemporary tropical luxury. Interiors are appointed with mostly exquisitely crafted, complementary, dark wood furnishings and fixtures with a number of modern and luxurious pieces. Amenities are thoughtfully premium – to insure the total satisfaction and recreation of each and every guest. 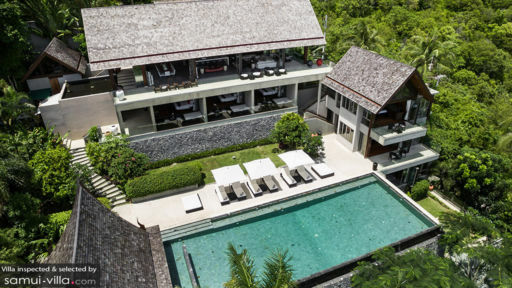 Erected on a mountaintop overlooking Bo Phut Beach, Villa Suralai – which literally means residence of angels – hands to you a truly restful and serene haven that’s close to heaven. The villa has six air-conditioned bedrooms. Three of these are on the ground level of the main pavilion. Three other bedrooms are in a three-level, exclusive, bedroom pavilion – one bedroom in every level. All bedrooms have king-sized beds. All bedrooms have dedicated bathrooms with rain showers. Bathrooms in the bedroom pavilion, though, also have free-standing bathtubs. Bedrooms on the ground level of the main pavilion and on the topmost level of the bedroom pavilion open out to furnished balconies with breathtaking views of the terrain and the distant horizon. The bedroom on the second level of the bedroom pavilion has direct access to the pool. The bedroom on the ground level of the bedroom pavilion has direct access to the garden. Along the edge of the property’s middle tier exterior is the 25-meter infinity pool. Leap into its refreshing, glassy waters which makes you feel that you’re out at sea. Up from the water, you can laze on cushioned, woven wood pool beds partially shaded by large umbrellas or on covered, cushioned day beds – all on the poolside stone deck. Or, relax on the wrap-around, cushioned, fitted couch under the shade of the sunken sala at one end of the swimming pool. On the sunny, airy and high-ceilinged second level of the main pavilion is the living area with its long, angled leather couches and chairs. Here, you can all hang out for some lively interaction. At the other side of this same pavilion is the dining area. On its timber wood table, you can all sample authentic Thai specialties – as well as foreign fare – served up by the resident chef at the fully-equipped, ultra-modern kitchen between the living and dining areas. 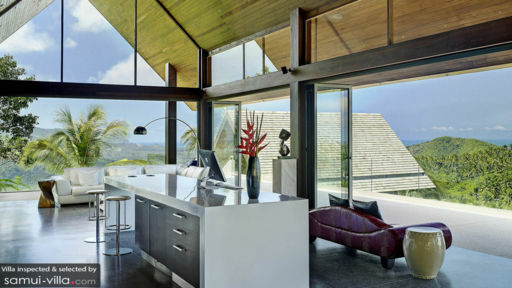 The kitchen also has a long counter which, provided with stools, doubles as a bar for breakfast, snacks, beverages and all kinds of drinks. The villa also has a fitness room so you can still do your routine workout even while you’re away from home. In charge of carrying out the villa’s day-to-day services is a staff composed of mostly housekeepers. In addition to the chef, a babysitter and a laundry helper may, upon your request, be called in. Their services, however, will be charged separately. Car rentals are available. Villa Suralai is situated in the vicinity of Bo Phut Beach. From the villa, go see the Samui Big Buddha and the Samui Crocodile Farm. For more sporty pursuits, go racing at Samui Go-KartBophut Hills Golf ClubFisherman’s Village Walking Street.